I work at Pediatric Specialty Care as Admissions Coordinator. The children (ages 0-21) we see are medically-fragile and technologically-dependent -- many are tethered to a ventilator that runs through a tracheostomy; most are wheelchair-bound, and cognitively impaired. They are all delightful children who face life with optimism and hope for a better tomorrow. 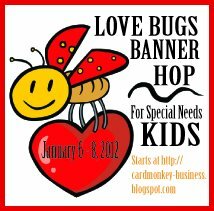 On this hop, we have 38 generous hoppers who have created fabulous banners. I've split the group in half so you're not overwhelmed with completing the hop in just one day. So DO stop back tomorrow to visit the second set of unique and precious banners. Please scroll down for the full list of today's hop stops. 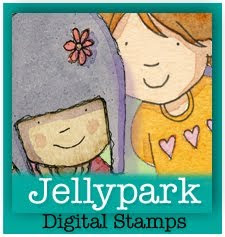 2 free digi-images to the winner of this prize! 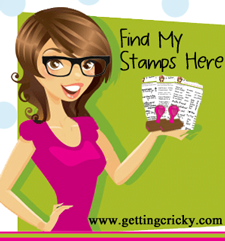 comments received on Day #1.
one fabulous stamp set to the winner of his prize! at Pediatric Specialty Care as their favorite. FIVE (5!!!) digital images to the winner of this prize. posted on Day #2 (Saturday). ...and stop back tomorrow, when ~20 different crafters will be showing their banners, and giving you more chances to win blog candy! On Sunday, January 8, I'll do a round-up of all of the banners from both days, with a SPECIAL BIT of BLOG CANDY for the commenters who visit that day ... so come back one more time then and CHECK IT OUT!! DON'T FORGET ... TODAY, HOP OVER TO SANDIE NEXT! Now that is the cutest thing! I would of never thought of making a chain..to cute! 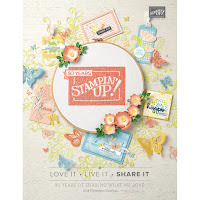 This is such a terrific idea for a blog hop! Your banner is adorable! awwwww, I saw the love bugs banner hop button thingy on a friends blog yesterday and I hopped over here to check it out and didn't see anything about it so I came back today :) Before I went off work a yr ago with an injury I worked with special needs individuals of all different ages and abilities at 3 different jobs. These individuals are so awesome and mean so much to me, I miss them all dearly, have already lost 2 of my three jobs while waiting for a diagnosis of my chronic pain issues caused by said injury. when I seen that this hop was for special needs kids I had to be a part of it, it is a fantastic idea and all these banners will truly brighten their lives. God Bless all of you, I am so happy in my heart with tears of joy on my cheeks, only saddened that I didn't find you sooner and been able to participate. Beautiful banner. I love that you used Doodlecharms!! Just made it to the end of the hop but will have to revisit later today. Being on the east coast I guess I hopped a little to early for some LOL! Ellen your banner is stunning! I love how you have used a paper chain and it looks gorgeous. Just to say a very BIG thank you for asking me again to be part of this wonderful hop again for the Children. You have a very big heart my dear friend and God Bless you! Hugs from "across the pond"
Banners are so popular and this one is spectacular. You did a great job and I love the little things in the middle of the circles. Very clever. Thanks for your time and talent. Hi Im delighted to say that this is my first ever blog hop and wow your banner is adorable, love the images and colours you've used. For such a wonderful cause I'd love to be with the children when they recieve these just to see the sparkle in their eyes. Im not sure how to become part of a blog hop, however could I ask if you would like any more people to participate could I be considerd please. I would like to contribute and give my support. Hi, Ellen! Thank you so much for allowing me to be a part of this wonderful project! You are such an angel for coordinating this. What a great idea to use the Doodlecharms cartridge. Never would have thought of that! Very cute! I love your banner and the paper chain is a great way to put it together. very creative. Thank you for this hop and for what you do. Putting your heart out there every day is very hard and only very special people (such as you) can do it. Hugs. Jearise in Lorby's World. I love the way you made the paper chain for your banner. You are a very special person...thank you putting together this hop and letting me become a part of it! This banner is so GREAT!!! I love the alternating hearts with them cutie bugs. You're riches in Heaven will be great my friend. You are a true blessing to these children through your hard, love-filled work. Oh this is super cute. Love that you used a paper chain. Will have to remember that for future banners. Awesome idea and helpful too! I know the kids love their rooms decorated. I remember making paper chains as a child...I need to check out the bugs on this cartridge. 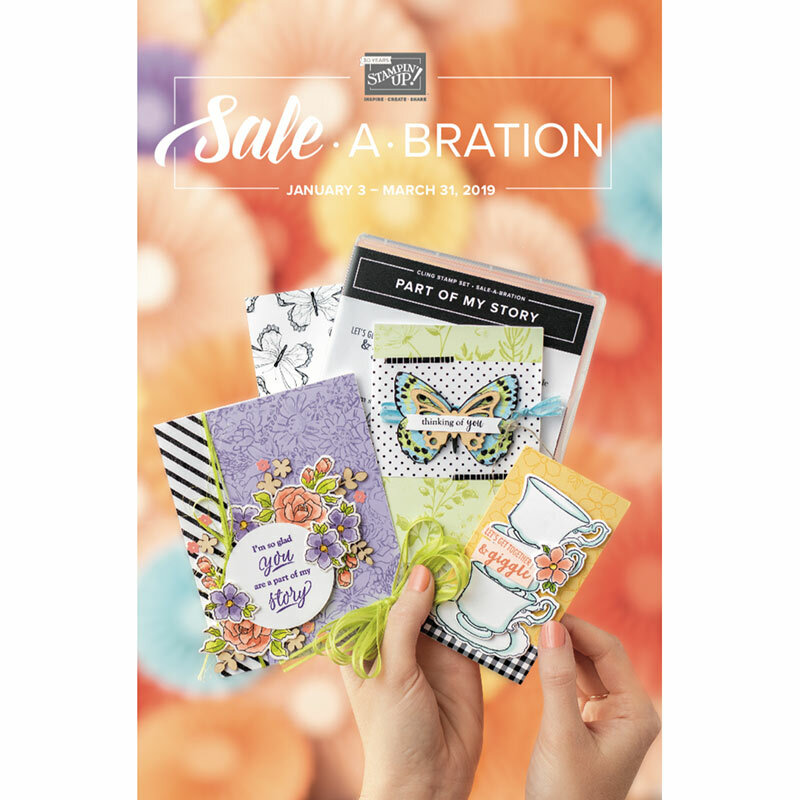 such a fabulous blog hop you are hosting.... Your banner is Fabulous. I love it. Thanks for putting together this hop...You are an Angel and I am so glad to be a part of such a great hop! I have never seen a chain link banner...so so cute. Love all the bright colors. Thanks for giving me the opportunity to be a part of such a wonderful event!!! Fun banner Ellen! LOVE the paper chain with this! Your banner is adorable. I never considered making a paper chain to string my banner - what a great idea. Ellen love the bright colors and t he paper chain. 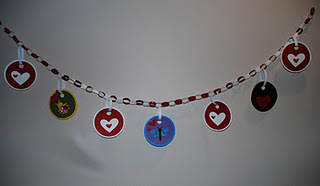 I love your paper chain banner!!! Super cute!! Thank you so much for sharing this opportunity with us!! Adorable chain design and for such a great cause. What a great idea for your banner and bless you gals for doing this for others! This is such a great reason for a hop, I have not. It is great that a lot of crafters participated. I love the chain being used for the banner, so festive. I really love the way you made each one look like a charm. This is a really cute idea! 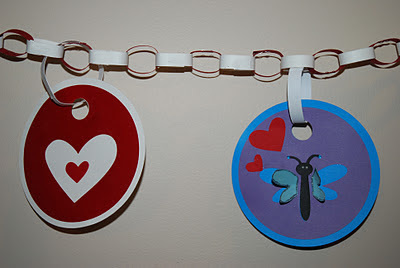 I love the paper chain idea , never thought about that one. ayour cuts are adorable Love the Bugs. Thanks for hosting this hop I just love creating these banners for the kids. You are truely a wonderful person ! Blessing comming your way! My granddaughter saw your banner and asked if she could make some. She loves doing paper chains and this is something new to add to it.